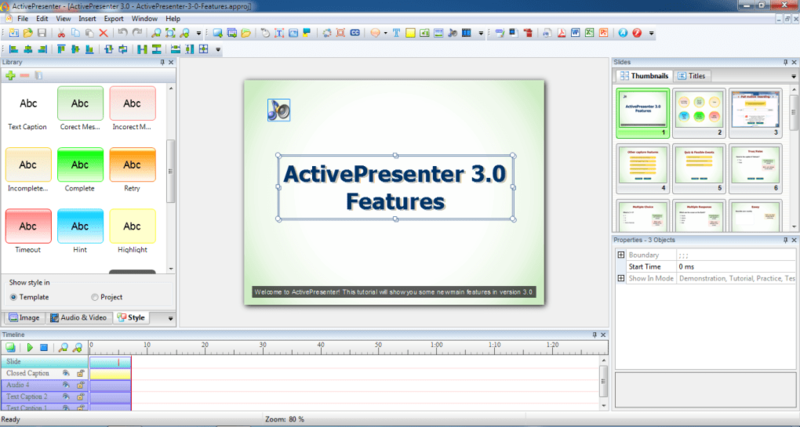 Active Presenter is a free screen recording and screencasting tool for Windows and OS X, enabling you to produce software demonstrations, software simulations, quizzes and presentations. It offers various export options: JPEG and PNG images, HTML slideshows, PDFs, Microsoft Word, Excel or PowerPoint presentations, interactive simulations, and a choice of video export options (AVI, MP4, WMV and WebM). This free application enables you to record your screen and create engaging screencast videos. ActivePresenter enables you to record any area on your computer screen in crystal-clear quality. It also records system audio and audio from external devices like microphones. The application includes advanced editing features and common operations for both audio and video, Cut, Crop and Join, Change Volume, Speed Audio or Video Up or Down, Blur Images, Zoom-n-Pan, add Captions, and Video Overlays. It is easy to export your creation to a video format of your choice and the software even supports lossless codecs in MKV format. Using Active Presenter as an Interactive eLearning Authoring Tool enables you to create interactive HTML5 training contents and video tutorials. ActivePresenter is a must-have tool for any business or educational professional, enabling you to stand out from your competitors. ActivePresenter allows you to create impressive interactive simulations and e-Learning materials. ActivePresenter is a screencasting and rapid elearning authoring software. 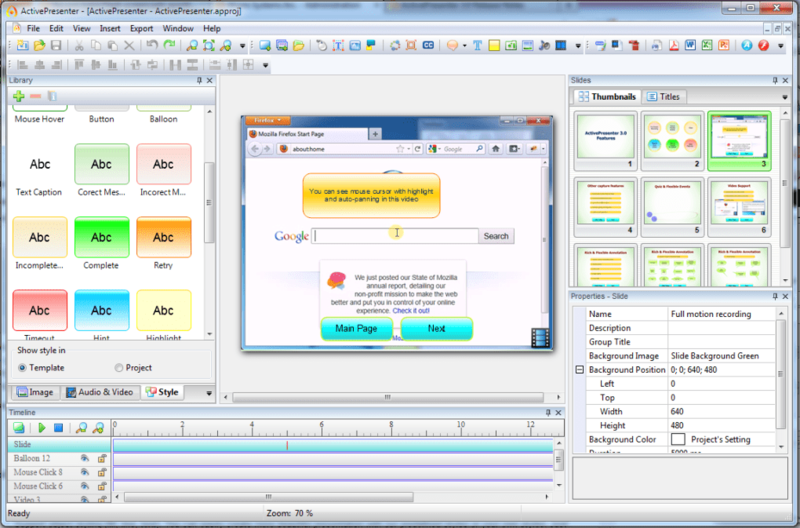 With fast, smart screen capture technology and a powerful authoring environment, ActivePresenter includes all the tools needed to record a presentation, annotate and easily convert the output to video (AVI, WMV, MP4, FLV), interactive AJAX and Flash simulation, or other document formats (PDF, DOC, PPT, XLS, HTML). Output can also be packed into SCORM compliant package to import and use in most Learning Content Management Systems(LCMS). Enrich your screencasts or elearning courses with voiceover, callouts, annotations, videos and graphics. Make your screencasts interactive by adding application simulations, branching scenarios, and quizzes. Easily publish to the web, desktops, mobile devices. Create SCORM-compliant content and quickly publish to leading SCORM-compliant LMSs. Track and report key metrics to evaluate learner performance. - Automatically generate popup prompts of onscreen actions such as mouse clicks, Enter key presses, right and left arrow movements and other user input. - Feature-rich editor allowing full editing. All slides may be re-arranged and audio overdub and editing is also built-in. ActivePresenter can help educators/trainers in preparing materials for corporate training. It can also be used to create and share screencasts. Great product - if it worked. Hey, it's free. That is the best that can be said for this product. If I had to pay for it, I would be looking elsewhere. Atomi Systems obviously wants to hook you on the free version, then get you to pay for an upgrade - a valid marketing strategy, especially seeing that the free version is adequate for simple projects. But the free version, which simply unlocks (no re-install) to get the upgraded features, is a poor ambassador for selling the product. It crashes often, sometimes on start-up. No other comments on this issue are necessary. Atomi needs to clean up their code. Before starting, you need to select a capture profile. There are several pre-made profiles, and you can also create your own based on the pre-made templates. Unfortunately, the options are confusing and poorly described in the documentation. Some of the options, such as audible mouse clicks, are grayed out in some profiles, with no obvious reason as to why. Again, the documentation is of little help. 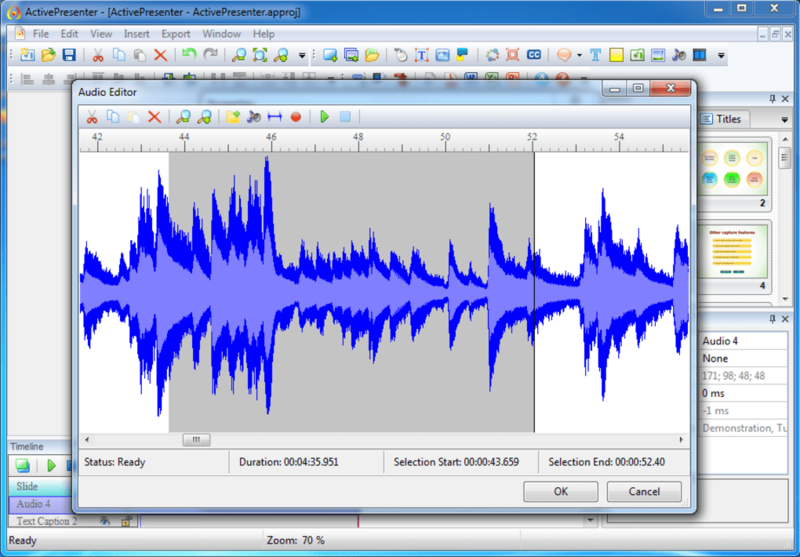 The UI is typical and familiar for audio-video software. That said, the UI will frustrate you. Most items can be dragged and fully adjusted in the time window, but some critical items cannot. One of those critical items is the speed and duration of mouse cursor movement Such items are adjustable only by selecting the item in the time window, then entering the time desired (in milliseconds) using the properties window for that item. Gets the job done, but why can't it be done with the mouse like everything else? Needs work. There are nice spotlight and highlight features, but again these will frustrate you rather than bring a smile to your face. The highlight can fade in and fade out. On the other hand, the spotlight, which is a far more dramatic effect, has no fade option. That makes this effect too jarring to use. In the support forums, many people complain that full motion video capture has poor synchronization between audio and video. I can confirm that problem. I also encountered issues in full motion recording (FMR) mode with having my voice narration and computer sounds drop out momentarily or cut off completely near the time of mouse clicks (which helpfully break the project into editable chunks). Atomi's repeated answer is that your computer isn't powerful enough. If a core i7 can't do it, what can? I wound up recording my project in Auto-FMR mode, which is essentially a series of non-motion screen shots combined with mouse cursor animation. This would be a great product if it worked well. Unfortunately, the frequent crashes and poor UI implementation make this a poor choice. It also suffers from poor documentation. The manual is pretty enough, with nice graphics and obviously produced at great expense. Unfortunately, it is poorly written and lacks critical specific information. If you absolutely have to do your project on the cheap, you can get it done with ActivePresenter. However, if you value your time, look elsewhere. Great feature set for a free product. Typical move / screencasting UI. Feature set lacks finishing touches.